UPDATED [12-19-2012] The U.S. Food and Drug Administration (FDA) is informing health care professionals and the public that the blood thinner (anticoagulant) Pradaxa (dabigatran etexilate mesylate) should not be used to prevent stroke or blood clots (major thromboembolic events) in patients with mechanical heart valves, also known as mechanical prosthetic heart valves. A clinical trial in Europe (the RE-ALIGN trial)1 was recently stopped because Pradaxa users were more likely to experience strokes, heart attacks, and blood clots forming on the mechanical heart valves than were users of the anticoagulant warfarin. There was also more bleeding after valve surgery in the Pradaxa users than in the warfarin users. Pradaxa is not approved for patients with atrial fibrillation caused by heart valve problems. FDA is requiring a contraindication (a warning against use) of Pradaxa in patients with mechanical heart valves. Health care professionals should promptly transition any patient with a mechanical heart valve who is taking Pradaxa to another medication. The use of Pradaxa in patients with another type of valve replacement made of natural biological tissue, known as a bioprosthetic valves, has not been evaluated and cannot be recommended. Patients with all types of prosthetic heart valve replacements taking Pradaxa should talk to their health care professional as soon as possible to determine the most appropriate anticoagulation treatment. Patients should not stop taking anticoagulant medications without guidance from their health care professional; stopping Pradaxa or other anticoagulants suddenly can increase the risk of blood clots and stroke. FDA previously released a Drug Safety Communication about the risk of serious bleeding associated with the use of Pradaxa in patients with non-valvular atrial fibrillation (the population for which the drug is approved). FDA has not changed its recommendations regarding use of Pradaxa in the population for which it is approved. If you have had a heart valve replacement and are taking Pradaxa, talk to your health care professional as soon as possible about your treatment. Do not stop using Pradaxa or other anticoagulants without guidance from your health care professional. Stopping anticoagulants suddenly may increase your risk of blood clots or a stroke. Discuss any questions or concerns about Pradaxa with your health care professional. Report any side effects you experience to your health care professional and FDA’s MedWatch program using the information in the “Contact FDA” box at the bottom of the page. Pradaxa is approved to reduce the risk of stroke and systemic embolism in patients with non-valvular atrial fibrillation. Pradaxa has not been evaluated in the treatment of atrial fibrillation caused by heart valve problems and cannot be recommended in these patients. Pradaxa should not be used to prevent valve thrombosis or thromboembolism (e.g., stroke, myocardial infarction, systemic embolism, prosthetic mechanical valve thrombosis, and vascular death) in patients with mechanical prosthetic heart valves. The RE-ALIGN trial was terminated early because thromboembolic events and major bleeding were significantly more frequent in the Pradaxa treatment arm than in the warfarin treatment arm. The use of Pradaxa has not been evaluated in patients with bioprosthetic valves and use cannot be recommended for such patients. Report adverse events involving Pradaxa to FDA’s MedWatch program using the information in the “Contact FDA” box at the bottom of the page. The safety and efficacy of Pradaxa (dabigatran) were evaluated in the European RE-ALIGN trial,1 in which patients with bileaflet mechanical prosthetic heart valves (recently implanted or implanted more than 3 months prior to enrollment) were randomized either to dose-adjusted warfarin or to Pradaxa (150, 220, or 300 mg twice a day). Initial dosing of Pradaxa was determined by renal function. In the warfarin group, the target international normalized ratio (INR) was 2 to 3 or 2.5 to 3.5, depending on the presence of risk factors and the position of the mechanical prosthetic heart valve. Keep track of your prescriptions for Pradaxa, note the dosage you have taken and the time period over which you took the drug. Keep any containers of Pradaxa and make a note of the pharmacies where you had your prescriptions filled. 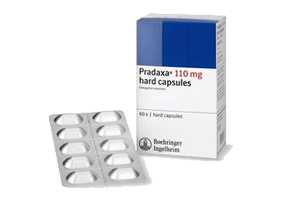 Pradaxa is a medication prescribed for people over the age of 18 diagnosed with atrial fibrillation not caused by valve disease. In all cases, Pradaxa use must be monitored, and side effects should be reported to the prescribing physician immediately. Some side effects may be fatal.